That is my newly turned 7yo mowing the lawn-- hooray! And he did NOT drive it into the pond-- double hooray! What a big boy! Can you see how his feet barely reach the pedals? He had to put bricks and a log on the seat to give it enough weight to reach the pedals and keep the engine from shutting down (which it automatically does if you lift up off the seat). Today I was thinking about this incident and how my kids are growing up so quickly (bear with me if you have teens and think that this is when they are really little kids, okay?). He saw the sign and audibly gasped. I heard him excitedly whisper Smoke. Free! And then I knew. I knew exactly what that boy was thinking. I hated to burst his bubble... but I did it anyway. "Tank, that does NOT mean that they are giving away free smoke!!! 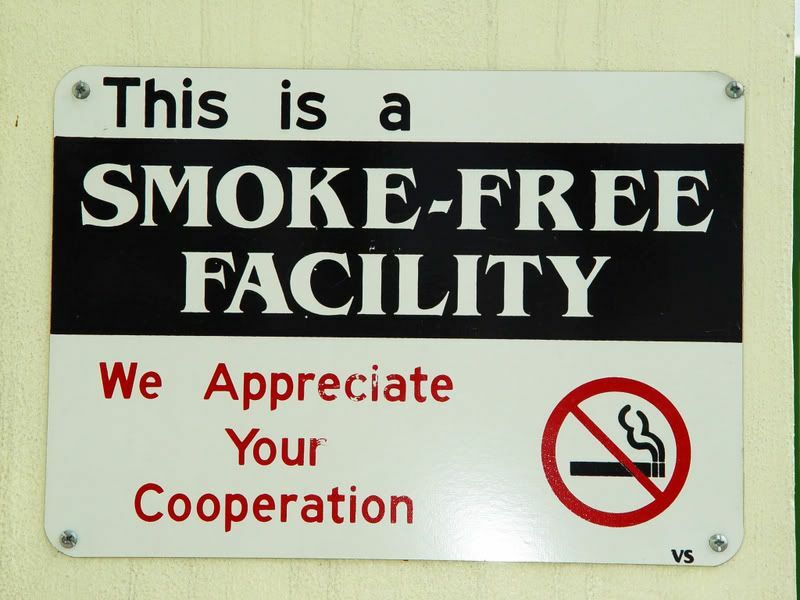 It means that you cannot smoke here." My little pyro was visibly disappointed, especially since they lit and launched and burned the very last of their roman candles, smoke bombs, strobe flasher thingies and other loud and bright and loud fireworks last night. Yup, he is definitely still quite little. I think we're going to have to start back with our lessons very soon. I don't know how much more brain mush I can take.